When we both fell pregnant first time around we went into panic mode—just what will we wear? Now that we’re both pregnant again (in case you aren’t up to speed we are both pregnant, at the same time, 2 weeks apart, wild!) we’ve got our maternity style down to an art. 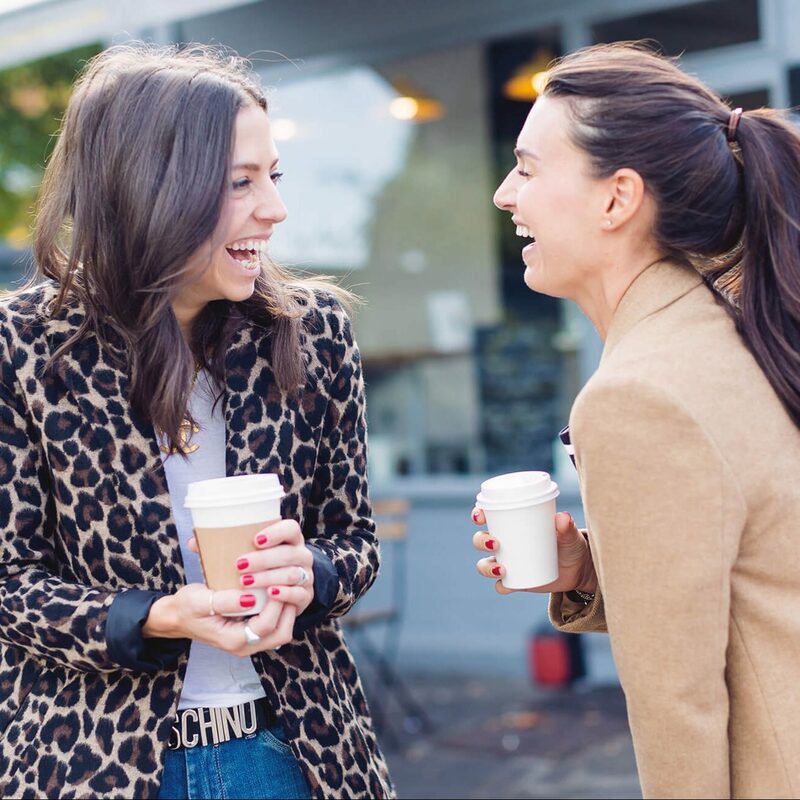 We don’t see much point in spending lots of money on items we will only wear over a six month period so we try to stick to non-maternity specific high street pieces, unless it’s an investment piece that will last us beyond pregnancy, like accessories and jewellery. You can’t have missed monochrome stripes, a trend sweeping the catwalks and high street at the moment. Stripes never go out of style. 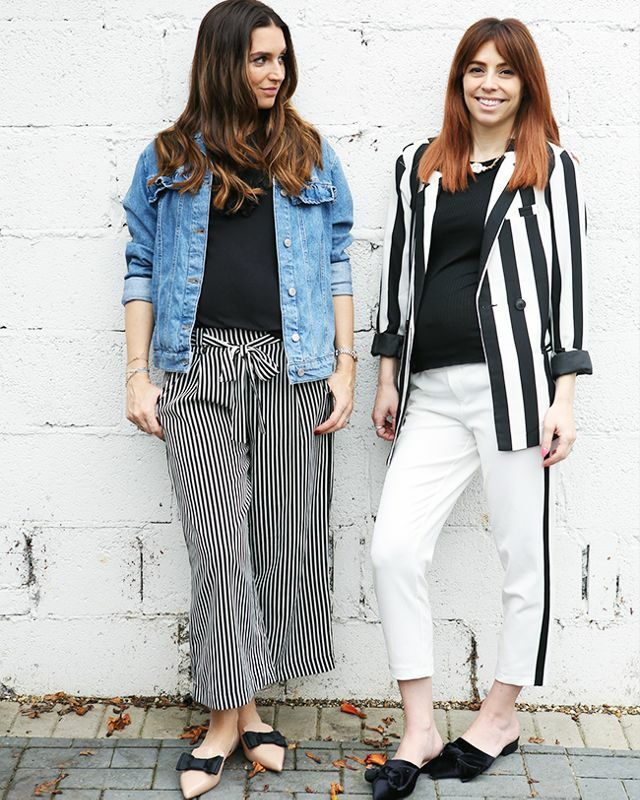 Monochrome is the most powerful of the stripe family and will always elongate your body. The high street is awash with them so you can opt for a blazer (we love this one from River Island) cropped trousers, jeans or a shirt. They will all conceal whatever needs to be hidden, just make sure you pair it with something more simple so you don’t look too Beetlejuice! If you opt for a new pair of monochrome trousers then stick to an elastic waist so they can sit comfortably below your bump. 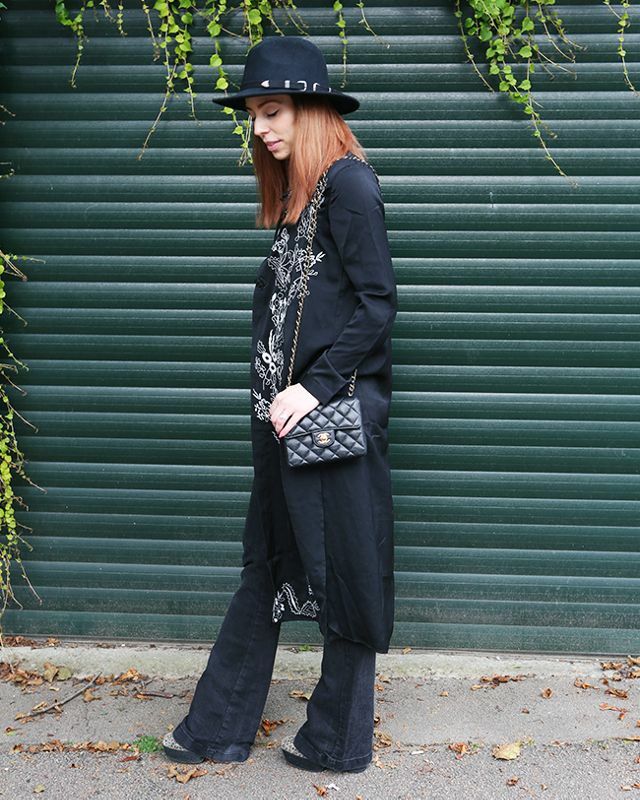 Styling out autumn in your first trimester is easy. When it comes to outerwear, anything long-line will elongate your body and draw the eye away from your stomach. 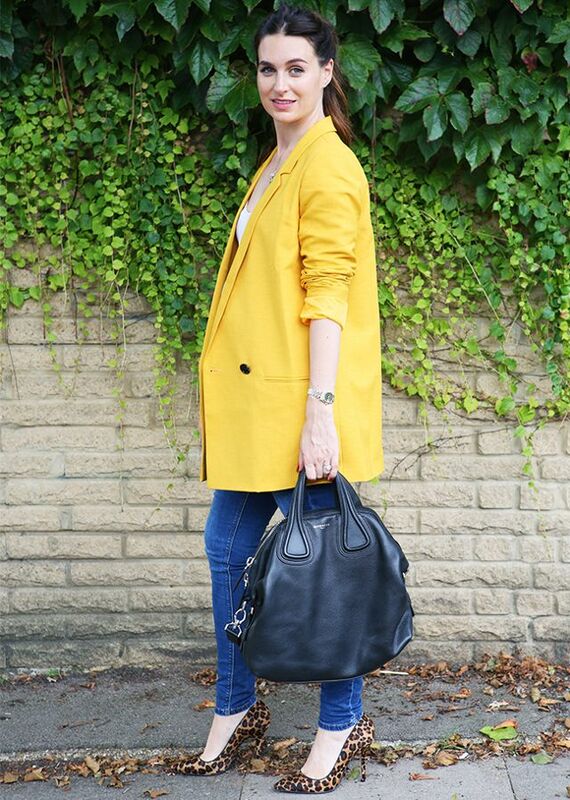 Cover up with longer, oversized blazers (make sure they fit around your shoulders neatly so you’re not swamped) and opt for something in bright colour like this from The Kooples or a print to detract away from your expanding waistline. If you prefer a more formal long line blazer, check it has long thin lapels as these will make you appear longer and slimmer. Giving a nod to a big A/W 17 trend, the kimono is a really useful item that will see you throughout your entire pregnancy and beyond as it’s great for covering up with minimal effort involved. Distraction is key when you are trying to hard a certain body part so as long as your pregnant belly is covered in a more neutral shade (black, cream, khaki, grey) then onlookers will be focusing elsewhere. Use accessories as a focal point—hats, oversized statement jewellery and large bags will always do the trick. Flat shoes can be sensible and still make a major statement—we’re both gravitating towards pointed toe muls and pumps with bow detailing. You’ll find a glut of them at Zara and all across the high street right now. Hope this guide helps you through that tricky first trimester!